EPA has proposed revisions to the respirator descriptions when required on pesticide labeling and is requesting comments from regulators, registrants, pesticide users, safety educators and other stakeholders on the changes. It is EPA’s goal to bring the respirator descriptions on pesticide labels into conformance with the current National Institute for Occupational Safety and Health (NIOSH) respirator language, delete outdated statements, and remove descriptions of respirators that no longer exist. Updated label language would ensure that pesticide handlers and their employers can easily obtain the information needed to identify and buy the proper respirator required for needed protection. 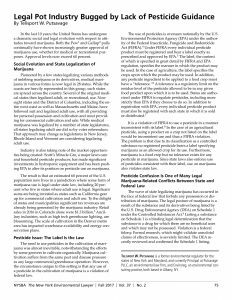 After considering comments, EPA will update Chapter 10, “Worker Protection Labeling,” of the Label Review Manual (LRM). After the chapter of the LRM is finalized, EPA will ask registrants submitting labels for other reasons to revise their personal protective equipment (PPE) statements to include the updated descriptions at the same time. Registrants who wish to revise only the PPE statements to incorporate the new respirator descriptions can do so by submitting a fast-track amendment with the changes. For existing products not otherwise updated, EPA will require the submission of labels with the revised descriptions of respirators during the registration review process. The proposed label revisions can be found at Revised Respirator Section of Label Review Manual Chapter 10. Submit comments on the revised respirator section by email at opprespiratortable@epa.gov by June 11th, 2018. The EPA extended the public commenting period for the proposed label revisions to June 11th, 2018 from May 22, 2018.